Natural weight loss is simply healthy weight loss and it is very achievable. The best weight loss plan doesn’t have to involve pills and strange sounding herbs. You can control cravings, increase metabolism and feel full while losing weight, all using the goodness of healthy foods. Hunger and food cravings are real issues when trying to lose weight, no matter what diet plan you choose. You can eat to lose weight. You just need to know which foods to eat to help you control those food cravings. Certain types of foods are known to not only stop hunger cravings but also boost your energy level so you’ll burn more calories. If you enjoy eggs, you’re in luck. Studies have shown that people who eat eggs for breakfast are more likely to consume fewer calories later in the day. Eggs can be prepared in a wide variety of ways including scrambled or poached, or incorporate your eggs into a healthy omelet with lots of heart healthy vegetables. If you’re worried about the fat content in eggs, use egg substitute instead. It has been shown however that the fat in eggs in actually a healthy fat, so eggs eaten in moderation should not be a problem. Eating high fiber, whole grains cereals helps promote a sense of fullness which can stop hunger cravings from developing. A bowl of bran cereal or oatmeal with skim milk is an excellent way to get a healthy dose of fiber and calcium as well as keep you hunger free until lunch time. Most vegetables are fairly high in fiber and water content, which result in a full feeling without adding additional calories. Here’s a great tip to help you consume less at meal time: Eat a fresh salad before your meal or a hot bowl of vegetable soup. You’ll end up eating less at meal time. Studies have shown that people who eat soup regularly tend to have an easier time losing weight, probably due to the high fiber and water content of the soup. Eating protein with a meal helps to fill you up and stop hunger pangs and cravings later in the day. Most fish is high in protein and low in both saturated fat and calories, which works to your advantage. A particularly good fish choice is wild salmon, which contains significant amounts of omega 3 fatty acids, which are excellent for the heart, among other benefits. Omega 3 fatty acids are difficult to get enough of in our regular North American diet, which is another good reason to include salmon in your diet on a regular basis. Eating spicy foods is a real plus for weight control for several reasons. Not only do spicy foods stop hunger cravings, they may also increase your metabolism for short periods of time after eating them, helping you to burn more calories. Plus, it has been shown that when you eat a spicy meal, you tend to consume less food and calories than if the food is bland. The active ingredient in chili peppers is capsaicin, which, in addition to appetite control, has a variety of healthy properties. So there are lots of reasons to kick up the heat! Stopping hunger pangs and food cravings can be done the natural weight loss way, without the use of potentially dangerous diet pills. Use the power of natural foods to help control your appetite, limit your calorie intake and take off those excess pounds. Healthy weight loss is the best weight loss. Originally posted to the site by Beth Casey from Medina County, Ohio/USA. It works every time but you need to work it; to work for you! Mix and match to get variety of proteins, fruits,and veggies. Water upon rising is key (I add lemon to mine – optional) 8 oz. Do the same thing for dinner. Be sure to drink at least 8 glasses of water daily. Snack in between with fresh fruit as needed.. don’t exceed 5 in a day. You will have variety and lose weight the good way. I also take a good multiple vitamin/mineral. You will lose on an average 2-4 pounds a week. If you have any health conditions, check with your doctor. Originally posted by Katie from Ottawa Ontario Canada. hello everyone! its katie s here! I have had a pretty bad experence with weight.. I am only 14 and got made fun of in grade 9 ALOT! well what i did was i did it for myself! i changed my diet A LITTLE BIT! i use to weight 180 at the age or 14. And drink lots of water!! Good for you Katie! Way to go! What determination you had to do it all for yourself. Great going and thanks for sharing that. By the way I changed your title because I think we should celebrate your success. wow , that is truly amazing ! but how long did it take you to lose that much weight anyway ? Katie, you are my idol!! I wish I had your willpower and determination. Originally posted by Amit Kumaar. Obesity happens to be excess of undigested body fat. It is our habits, be it diet or sedentary lifestyle that is the major cause of obesity. Energy imbalance & extra calorie intake is also one of the major causes of obesity apart from this. 1.Avoiding rich and junk foods like pizza, ice cream, burgers. 2.Avoiding alcohol, cocaine and Intoxicating drugs. 3.Drinking at least 4 liters of water per day, and including more of green tea, lemon tea in the daily diet to flush out toxins from the body. 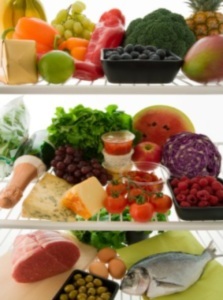 4.Eating fresh fruits, raw vegetables more in the diet. 5.Learning to Eat Healthy Snacks like celeries, corn, cucumbers etc to have more fibers in the body.